Amethi April 17 (IANS) With ATMs suddenly running dry in several states Congress President Rahul Gandhi on Tuesday said the "terror" of demonetisation has returned to haunt the country slamming Prime Minister Narendra Modi for what he described as destroying India s banking system. He took to Twitter to take a poetic dig at the Prime Minister and also spoke to reporters here alleging that Modi has assured "acchhe din" for fugitive jewellers Nirav Modi and Mehul Choksi leaving the poor of the country high and dry. "Understand the deceit of demonetisation your money goes into the pocket of Nirav Modi. Modiji s fascination for (Vijay) Mallya the terror of note-bandi spreads again. The ATMs of the country are empty again what is the condition of banks " Gandhi asked on the second day of his two-day visit to his parliamentary constituency. He criticised Modi for his silence on the banking frauds allegedly committed by the diamond merchants who have fled the country. "Modiji destroyed the banking system. Nirav Modi fled with Rs 30 000 crore and the Prime Minister didn t utter a word " Gandhi said. "We were forced to stand in queues as he snatched Rs 500-1 000 notes from our pockets and put them in Nirav Modi s pocket." Gandhi dared Modi to allow him to speak in the Lok Sabha for 15 minutes saying the Prime Minister was scared of speaking in Parliament during the second half of the just concluded Budget Session which was completely washed out in protests. "Had we been allowed to speak in Parliament on Rafael (jets) issue Nirav Modi matter the Prime Minister won t be able to stand " he said. "The acchhe din he (the Prime Minister) had promised for the nation have ushered only for 15 persons including Nirav Modi and Mehul Choksi. For the poor of this country including farmers labourers and daily-wagers it is all bure din ." Addressing a public rally after inaugurating more than a dozen developmental projects in Jagesarpur in Amethi the Congress chief said while the Prime Minister boasted of a "56-inch chest" in reality he has no place for the poor in his heart. He also targeted the Yogi Adityanath-led BJP government in the state saying there had been no development in the past one year. Accusing the Prime Minister of inciting passions on lines of community and religion Gandhi said the Congress was fighting a battle of ideology with the BJP and would win. 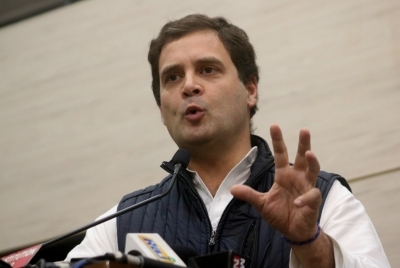 Pointing out how the Union government had waived off loans worth Rs 2.5 lakh crore of the rich and elite he sought similar debt waiver for farmers. He said he had once made such a request to Union Finance Minister Arun Jaitley but was told there was no such provision. Gandhi also questioned the track record of the Modi government in providing jobs to the unemployed youth.